A: Denver new airport big, big, big, big scandal. Q: (L) What kind of scandal? A: You will see. Dallas airport is secret base; Orlando too; Miami Too. 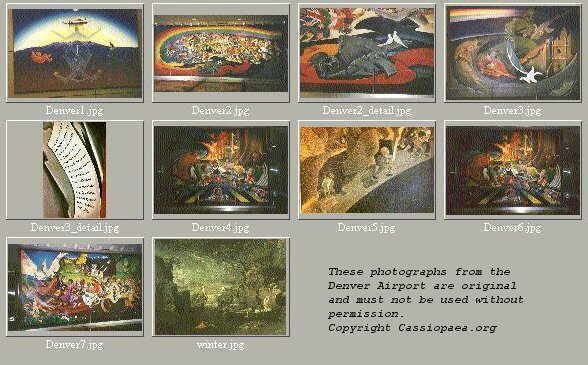 Q: (L) What about Denver airport and how does it relate to prophecies? A: Denver reveals the government. Look for it. Pay attention. Q: (L) I recently received some information about the Denver Airport. It seems that there is confirmation that this Airport does have some connection to something very mysterious. And, you brought this up in the very first contact. Is there something more on this? Q: Okay. Back to Mr. M__. He says that he has found, through applications of “mystery” teachings, and certain personal enlightenments, as well as the application of sacred geometry principles, the exact location on earth where one can transcend space and time, as he puts it. Is there such a place? A: There are “points” where this process is facilitated more easily, but it is the process which is most key, not the locator. It has to do with magnetic field meridian conjunctions. Q: Okay, he suggested that I look at Pouisson’s painting ‘Winter,’ for clues. 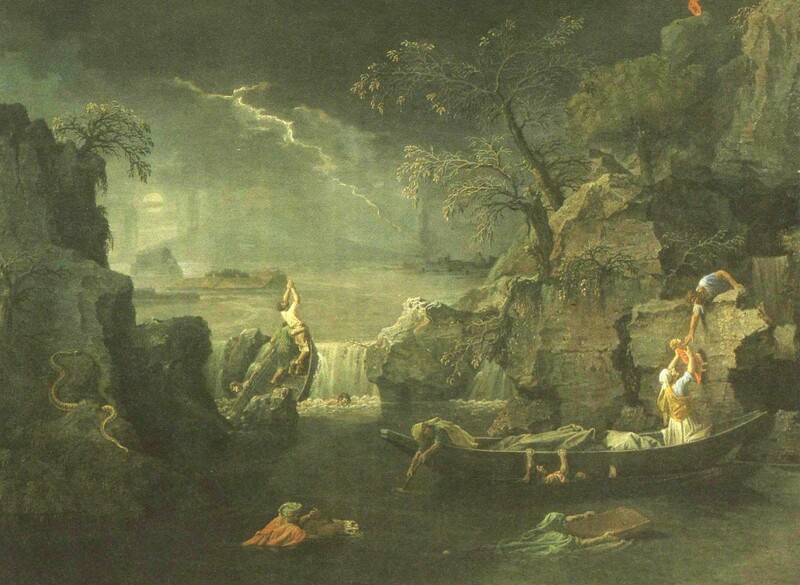 Q: Well, he described it as a figure of Noah clinging to a horse between two pillars. Other than the alchemical symbols I have discovered through etymology for the horse, what other implications does this figure suggest? A: Maybe it is something about either the notation of the “knight,” or the gas nebula in Orion. By the way, Laura, have you contemplated the life of your father? Hmmmm? Big clues to be found there?? And, if so, what? What indeed!! Q: Now, I noticed when looking at the map that there is a place called “China Lake Naval Weapons Center” right next to Death Valley. I mean, aside from the fact that it is a NAVAL station nowhere near water, is this connected in anyway to these underground bases or cities? A: In a circuitous way. Q: I also notice that Edwards Air Force Base is a little to the South of there, and my guess is that these bases are connected to this underground tunnel system, these underground bases or cities. Am I going in the right direction? A: Draw a line on the map to connect Death Valley, Edwards, and the Antelope Valley. Then connect with Mount Shasta, Mount Ranier, Back to Las Vegas, on to Sedona, over to the Archuleta Mesa, then on up to the Denver Airport. Q: Well, speaking of the Denver Airport, C__ may be going there soon. Any comments? A: Then have C__ go to that airport, observe carefully, then report back her findings. Very important, because the murals there are directly connected to what you are studying carefully right now. Superclues to be found there, which can point to monstrous future plans of 4th density STS and much, much more. Q: Just who are the good guys? A: Not that simple… and much, much deeper meaning. Did you catch the latest report about Neanderthals and DNA and how it relates to you? Q: Could you give us a little interpretation on it? It’s pretty strange. A: It is a rectagon. Q: What is a rectagon? A: Picture uniting numerous rectangular principles of photo optic representation. A: If one gazes at it long enough, they will involuntarily be placed into an alpha state. Q: Okay. If they go into an alpha state, is there some other kind of message that the picture then conveys? A: That is not the point! A: They then are open to programming of a level one order! Q: (A) Does the scale of the picture matter? A: It works better when one gazes at the mural itself, rather than a photographic representation of same. There are magnetic factors at the Denver Airport which play into the situation. Q: What kind of magnetic factors? A: Artificially contoured wave-like beams. Q: (A) If gazing at this picture produces an alpha state, how long does it last? Q: (T) How long do you have to look at the picture? A: Each individual responds differently. Q: (T) Does repeated exposure … is it cumulative? Q: When you say indefinite in terms of time, do you mean it can vary from individual to individual? A: Indefinite because the subsequent program is the determining factor. Q: How does the program get installed? Is there something there at the airport that installs the program? That works in conjunction with the murals? Is the programming in the pictures? Or is it in some carrier wave? Or is it in the individual themselves, and the murals simply activate it? A: Originates from underneath the complex. Q: And it has something to do with the beams? Q: So, in other words, C__ may have been subjected to some of this programming by going there and spending so much time looking for the murals? Q: (A) Is any one of these photographs, or any one element, more significant than the others? Anything we ought to pay more attention? A: All are equally important. But, pay attention to the tiny details. You will see that the discovery process is neverending. A: This is a pictorial representation of an essence of a concept of overt control. Q: So, does this mean that overt control is NOT going to be used, since this huge ugly figure is lying there seemingly dead? Q: (T) Is Alex Christopher’s general idea of the meanings of these paintings correct? A: Close. You should learn what you can, discreetly, about masonic principles. Q: (A) I would like to know if the Cassiopaeans, together with other STO, are participating in some of this programming? A: There is no need for us to participate in programming. A: Because we do not violate free will directive!